Hello IT folks, here we go with strictly technical post. Sometime back, I was just stumbling upon somewhere on the web and I came across this beautiful statistics someone came up with. There are always some dudes playing around with somethings to create something new in this world. 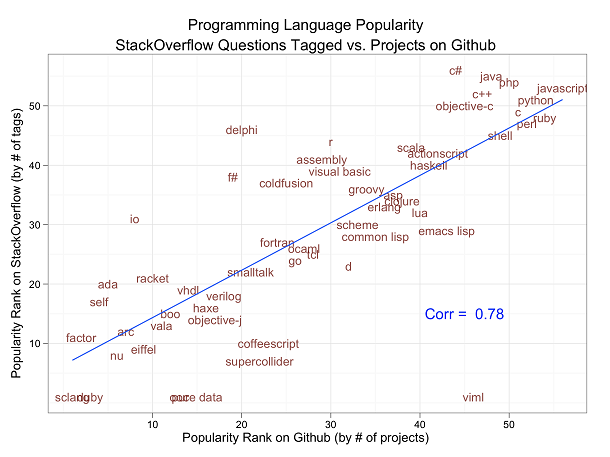 Some guys just classified the popularity of the programming languages by the number of tags on Stackoverflow and the number of projects in those languages on Github and the results were as depicted in the following picture. 3. Multi-platform, developed on Windows, Mac and Linux. While Mozilla is upto developing a totally new programming languages, despite of Apache Software Foundation resigning from Java Executive Committee, Oracle has taken initiative in releasing a higher version of Java 6. Oracle Corporation has announced the release date for Java 7 to be July 28th 2011, whereas it is also working on the development of Java 8 and seems its release will be announced soon too. So lets see how does the above picture change with the advent of new technologies and the arrival of new programming languages.